ALBION is a Morecambe Bay prawner or Nobby, built in 1906 by Crossfield of Arnside, Liverpool. She fished out of New Brighton until 1940 under the ownership of John Wright. 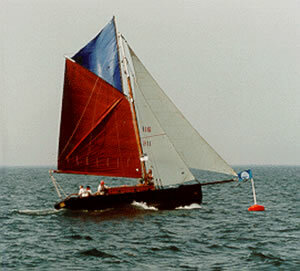 She is carvel built of pitch pine planking on oak frames and has one timber mast rigged as a gaff cutter. The vessel was built with no engine and was first engined in 1925/6; she now has a Thornycroft 4 cylinder diesel engine. In the 1990s, her mast, bowsprit, running and standing rigging, sails, engine, cabin and her keel were all renewed - she won her class racing in 1994 and 1996-98.